Sarah Thomas had a typical childhood growing up in Mississippi. She played softball in high school and attended the University of Mobile on a basketball scholarship. She works as a pharmaceutical representative and is married with three children. 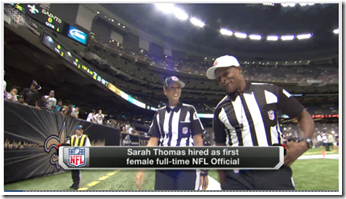 She sounds normal but she is definitely not – she is now the first permanent female game official in the NFL. Thomas has been officiating football on and off for 19 years now. Despite trying to focus on her career and family, she was approached in 2006 by Gerald Austin, a coordinator of football officials for Conference USA. He invited her to attend the officials’ camp and was impressed by what he saw. Thomas was officially hired by Conference USA in 2007 and, since then, she has continued to impress and move up the ranks. In 2009, she became the first woman to officiate a bowl game. In 2011, she became the first female referee to officiate in a Big Ten stadium. Now, she is an official NFL referee. Overall, Sarah Thomas is a great ref with a lot to offer. Her exemplary refereeing will hopefully pioneer the way for more woman to follow her lead.